President Donald Trump said Monday the US will start cutting aid to Guatemala, Honduras and El Salvador as a caravan of thousands of mostly Honduran migrants rolled on regardless toward the US border. Trump kept up his almost-daily Twitter attacks on the approaching caravan, calling it a national emergency and said he had alerted the US border patrol and military. "We will now begin cutting off, or substantially reducing, the massive foreign aid" that the United States provides to the three Central American countries, he said. Mexican authorities had managed to block the "caravan" of migrants on a border bridge between Mexico and Guatemala, but many later crossed the river below in makeshift rafts before marching north. Activists say the journey through of at least 3,000 kilometers (1,800 miles) through Mexico to the US border could take a month. 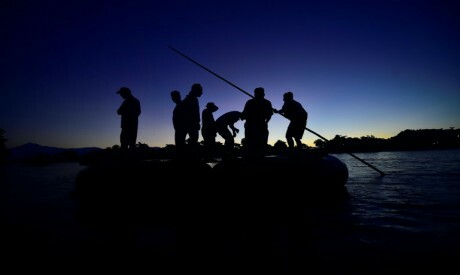 "We are well aware that this country (Mexico) didn't receive us as we expected, and they can return us to Honduras, and we also know there are drug traffickers who kidnap and kill migrants," Juan Flores, one of those migrants, told AFP. "But we live with more fear in our country, so we carry on forward," he added. US Secretary of State Mike Pompeo also warned that the migrants "may be victimized by human smugglers or others who would exploit them." "We also are deeply concerned by the violence provoked by some members of the group, as well as the apparent political motivation of some organizers of the caravan," Pompeo said in a statement. On Saturday, Mexican authorities opened the border for women and children on the overcrowded bridge, taking them to a shelter in Tapachula, about 40 kilometers from the border. Morales and his Honduran counterpart Juan Orlando Hernandez said after meeting that the march was "violating the borders and the good faith of the states."